February 2017 we played at Glastonbury Assembly Rooms: Pok, Chris, Clive, Matt, Stella, Rosie, Aurenia and Gerry. Space Goats have Dragons on Tape One. Space Goats have Prophecy on Tape Two. Space Goats are a collective of musicians working together to create a current and varied show. Music ranges from songs and bardic tales played on traditional instruments, acoustic ambient trance, through to Pixie punk and electronic folk with sharp lyrics. Wherever you see Space Goats play, be it ancient sacred sites, community Green Fairs or major festivals and clubs, Space Goats varied set will keep you enchanted enthralled and dancing to those tribal rhythms all night long. Kingston Green Fair – Small World Stage. May, 29th. Glastonbury Festival Green Futures Field – Small World Stage. June 23rd – 25th. More dates to be arranged! Space Goats are planning a European tour from the end of September. Watch this space! Space Goats went through an incredible transformation in 1999. With the new millennium just around the corner, spring brought with it major line up changes as some of the old GOAT herd moved on to other projects. Pok, Ruth, Clive and Hills kept the Space Ship afloat as we were catapulted into deep space and various festivals over the summer, and after an inspired meeting with Mr Fraser Clark from the Parallel University we landed at Warp2 in September. The Warp Experience! What a way to see out a millennium. The Warp gigs proved a great success with our own stage we grooved the night away with inspired 24-hour marathon music sessions. However, Pok a man of great innovation had other ideas for the herd, and over the winter connected with his old chums Gorge and Dave Grape to add bass guitar and kit drums to the shrunken space goat line up. What a revolution! Space Goats performed their first full electric gig at Exeter Art college in February 2000, with Zeg back on Basouki and Jim Invisible on keyboards, Space Goats discovered what they always secretly new, They love Rocking through Martial amplifiers! HELLO 2000! 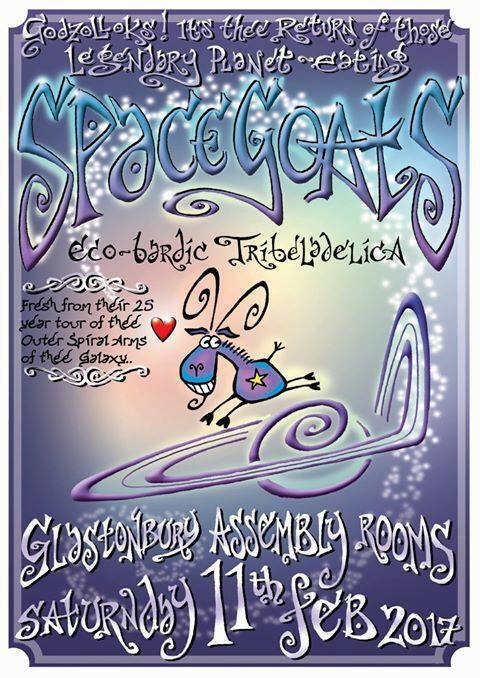 Spacegoats play Glastonbury Assembly Room and earth Tribes gather!!! Indeed!! Phew, Spacegoats just got breath back after hitting stage running following tour of the galaxy sorry about the 17 year gap. Goatmoot generally ’tis good that tribal voices people iz still about and there was some very young elflings in the front row as well as quite a few leprechaun bootriders. As announced above, the times were changing, an almost complete change of personel shifting through several permutations slowly occured new recruits a new and decidedly not acoustic sound was introduced by pok. I was root towards going, reliving teenage band I never had and this Spacegoats made a couple of albums, the first was with the rather glorious moments of remnant original line-up of pok , Clive Ray, augmented by new member whom I dubbed Golden Boy, now Green Avatar. Hills, as we called him then. 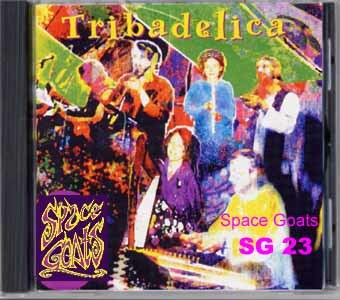 Tribadelica was the last offering of the original Spacegoats style acoustic-with-didge-and-dulcimer band. At Earth Spirit Spring one probably April ’99 (?) we decided to split up as we had been. People wanted a break and to get on with their lives. It was understandable. Spacegoats had not just been a big chunk of our lives, It had been our lives for roughly seven years. We were all we knew! The creating of it had been intense. This came to an end. Pok went with Klover to Spain and on returning he realised that the Who are the Pixie People song had quite honestly exploded into the media on the Millenial Wings of the media in a new show which at the time was an utterly novel phenomena. This was Sasha’s (a.ka. Ali G) far out new show that led on from my only knowledge of him to that point, in appearance as one host of a show I detested and deeply resented. He seemed in a different dimension to the other hosts, whose cheap TV of insulting common people in the street disgusted me, causing a vow to do one of their heads in if chance we met. Which in fact occured. It was curious feeling to have sent out such a call to pixie kind to do something to avert or tune into some earth pangs before it’s too late, but the band you did it with to have dissolved into the mists. The evidence remains. It is a curious feeling. A dream mostly, all that time. Long ago. We got given the 2 Towers and all after. Lush green trees and corresponding energy and economy not, ha ha. It was curious and somehow great to return to being in some kind of anomility as a semi tramp or mendicant, but for a few years it was madness with the ‘Pixie People’. *Crystal Palace eviction was to me a bit like the Isle of Wight festival. ** To my mind it marked the end of an era of non-violent direct action protest camps of a certain style in the UK. ** The one were Jimi played pretty much his last show and Hawkwind played outside of, with the film, album and fences and hippies/breadheads ratio hassle. After this the 60s festivals birth had happened and reality of ’70s started. My point? End of an era. Not that these are real lines in time but I certainly felt a difference. Spacegoats with me writing most or all songs went electric then ended 2004. I was alone but a new phase started of the notion of being something more clearly defined as a role. Some readers may find it pretentious but it was all I ever wished to be in a sense of how a culture can key in. The interpretation of this is up to you. Years pass and fostering a small unit and child not of mine but onboard, Aur and I going around with Anglo-French troubadour connection retrouve, Troubadour Perdu, Lost Troubadours. And I does various so-called Bardic Albums. Susanna started it. She first called me a bard. Certainly in Glastobury circa 2005/6 when Tim Hawthorn was there founding the Bardic Chair of Ynns Wittryn. I saw the band at the Green Gathering this year. Blown away with the music and want to buy a recent CD. Is there one available anywhere as I can’t find one on line?